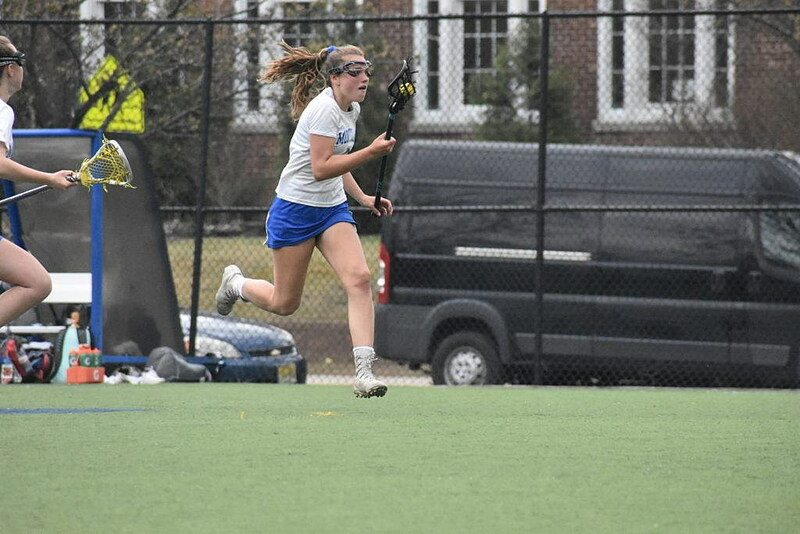 MKA’s Megan Palmisano had three goals against MHS in the Cougars’ 11-5 win on Friday, April 12. 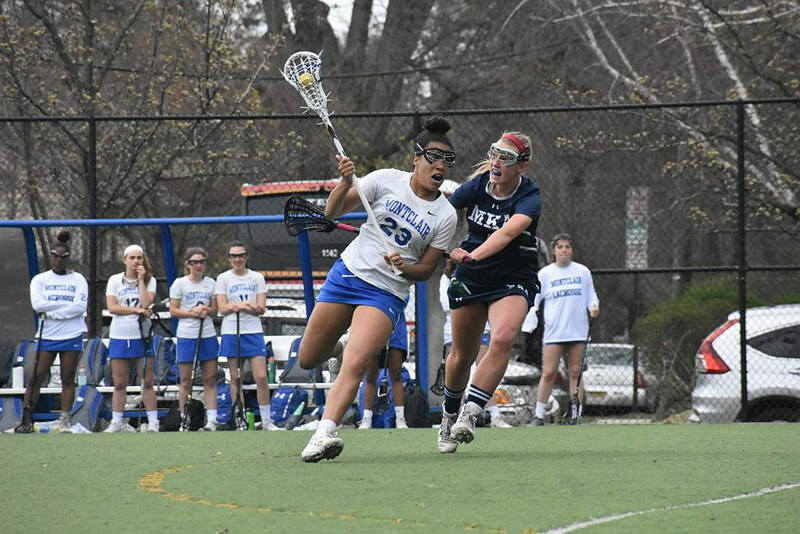 The Montclair Kimberley Academy girls lacrosse team continued their red-hot start Friday afternoon as they defeated crosstown rival Montclair High School, 11-5. For the Cougars (6-1, 3-0), it was an opportunity to rebound from their 15-14 loss to New Providence on Wednesday. The Mounties’ record dropped to 1-6 overall this season. With Montclair High School looming, the Cougars knew they had to refocus, and quickly. “Yesterday was a great practice going into this Montclair game,” Intrabartola said. That showed, as MKA got out to an early lead, with team-leading scorer Claire Linaugh putting the first goal of the game in the net at the 20:45 mark. The Cougars’ Taylor Everson then scored the next four goals of the game before the Mounties finally found the back of the net with a shot off a penalty made by Emily Crane with under five minutes to go. The Cougars struck first again in the second half when Megan Palmisano beat MHS goalie Jada Auletta low at the 23:40 mark to make it 6-1. 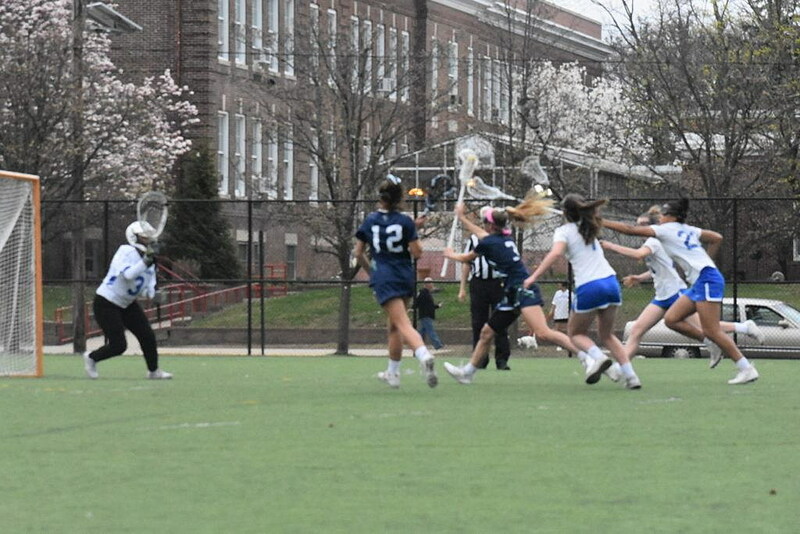 Nanette Walls-Tarver answered for Montclair High shortly after but MKA responded with two goals of their own—one by Palmisano and the other from Kirsten Zeug off a penalty—to make it 8-2. Cougars attacker Kirsten Zeug gets ready to fire a shot past MHS keeper Jada Auletta during MKA’s 11-5 win. MHS wouldn’t give up though. Crane scored two goals in a row before Yael Gelman added to the Mounties total off a pass from Walls-Tarver. Suddenly, it was 8-5 with 8:24 left and MHS looked like it had the Cougars on their back foot. However, just as they have all season long, MKA responded, this time with back to back goals by Palmisano and Avery Song, putting an end to the Mountie surge. Everson then put a cap on the game with her fifth goal of the day with under a minute left. To Intrabartola, while the scoring was great, it was her defense and goalie which really stood out. MKA defenders like Katie Hipp (right) worked hard to contain Nanette Walls-Tarver (left) and MHS’ other offensive threats. Defense has helped the Cougars far outscore their opposition this season by a whopping 107 to 51. Even with the 15 goals they allowed in the loss to New Providence, the Cougars defense and goalie Reilly Hughes have held opponents to an average of just over 7 goals a game while the offense has averaged just over 15. With a really nice performance against the Mounties, you can see every level of the field humming for the Cougars, who look hard to beat right now. There’s not any one person to focus on stopping on this Cougars squad, as anyone can contribute at any time. Emily Crane scored three times for the Mounties against MKA on Friday, April 12. Losing to a good team isn’t any less frustrating for the Mounties, who have struggled early this season. Friday’s loss marks the fifth in a row for Montclair High, a team that is much more talented on paper than their record indicates. They’re getting consistently good goaltending from Auletta, but have not been able to put points on the board consistently. 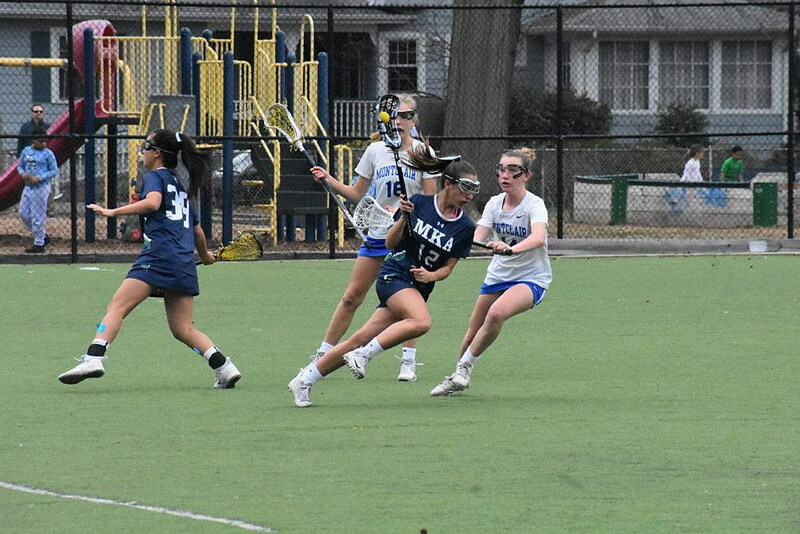 Turnovers, bad penalties and inconsistent overall play all have been part of their early woes, and against a tight, disciplined and talented teams like Montclair Kimberley, Oak Knoll and Immaculate Heart, those are things that have cost them games. Both teams have the weekend off now, picking up their season again on Monday. MHS will take on Chatham on the road at 4pm, while MKA heads to Columbia for their fourth division game of the season.